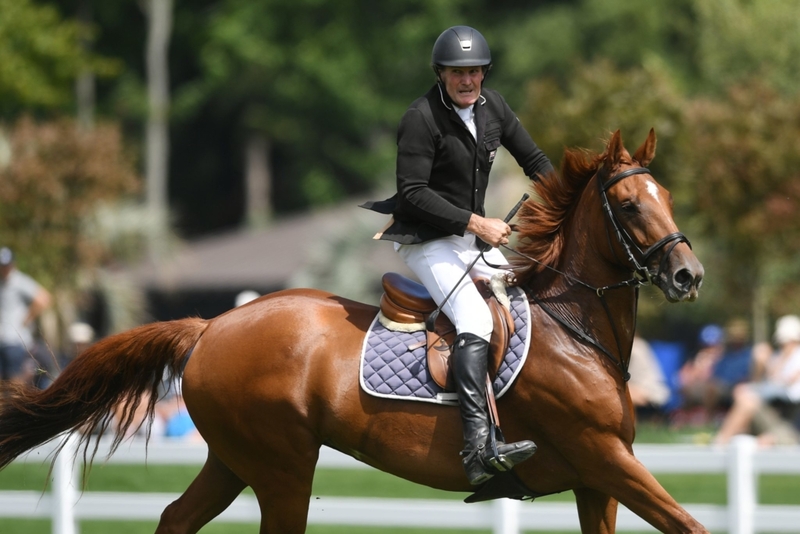 Maurice Beatson may have been the oldest competitor in the field but that didn’t stop him taking the honours in the Horse Grand Prix at the inaugural Takapoto Estate Show in Cambridge this afternoon. He was the last of 10 combinations through to the jump-off over the Gerrit Beker-designed course – the leaderboard stacked at the top by three visiting Australians. Beatson, aboard his eight-year-old homebred mare Gold Locks, carried the weight of the crowd with him as he cleared jump after jump in the Dunstan Horsefeeds and EquiFibre sponsored class. While the Dannevirke farmer was clear in the first, he took the first of the double in the jump-off but was trying to ensure he covered the time well. It is the second season Gold Locks has showjumped. Coming in for second was visiting Aussie Brooke Langbecker aboard her lovely chestnut warmblood stallion Quintago I, who were also on four faults, Clint Beresford (Aus) aboard Emmaville Jitterbug were third on eight faults, with Stuart Jenkins (Aus) on Fairview Aliquidam in fourth place. All place-getters were hugely complimentary to Mitch and Kate Plaw and their vision to create such a world-class showjumping venue. Emma Watson (Morrinsville) and her delightful Maddox Fun House took out the Country TV Pony Grand Prix after a heart-stopping jump-off against Olivia Apatu (Hawke’s Bay) aboard Alasaan Arzu. The big open arena called for good fitness from the combinations. Apatu was clearly chasing a relatively careful clear but came unstuck early and ended with 12. Third, fourth and fifth places were filed by four-faulters Sarah West (Matamata) aboard Miss Mae West, Peita Milne (Nelson) on BG Lennox and Ally Carson (Putaruru) with Tiger Tale LS respectively. The Ann Symes Memorial Horse 1.3m Derby brought the curtain down on an incredible four days of jumping at Takapoto Estate. Tamara Silcock (Nelson) and her lovely grey mare Steel Magnolia headed home the 17-strong field, finishing on four faults in a time of 1.32.8. “I am so excited,” said Silcock, who has had the horse not quite a year with plans to produce her as a showjumper. The combination won the National Derby in Christchurch earlier this year and she had targeted this event with the hopes of a second victory. 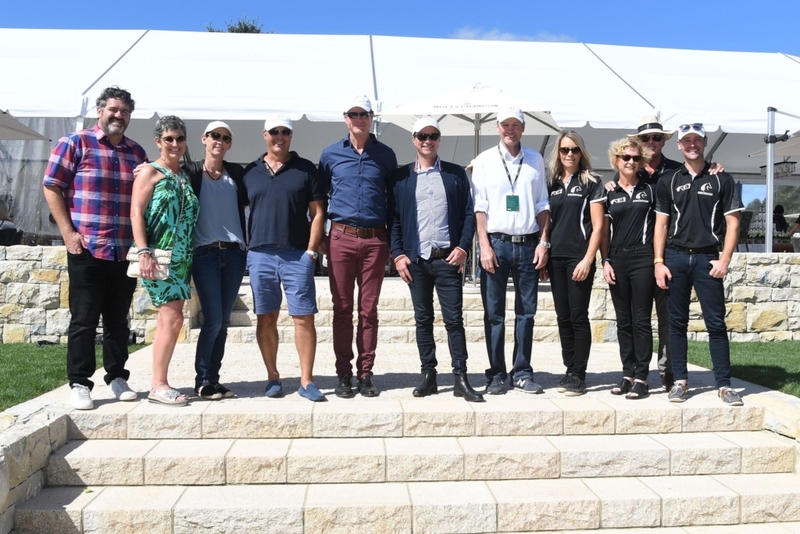 More than $30,000 was raised for the New Zealand team to compete at the FEI World Equestrian Games later this year in Tryon, in the United States. Takapoto Estate Show is a new show, set in a stunning 600-acre property on the outskirts of Cambridge. Gold Tour Horse Grand Prix (part of the Dunstan Horsefeeds and EquiFibre Horse Grand Prix Series): Maurice Beatson (Dannevirke) Gold Locks 1, Brooke Langbecker (Australia) Quintago I 2, Clint Beresford (Australia) Emmaville Jitterbug 3, Stuart Jenkins (Australia) Fairview Aliquidam 4, Daniel Blundell (Auckland) Ocean Beach 5, Katie Laurie (Australia) Casebrooke Lomond 6, Lucy Olphert (Tauranga) Eve Saint Laurent 7, Lily Tootill (Karaka) Ulysses NZPH 8. Pony Grand Prix (part of the Country TV Pony Grand Prix Series): Emma Watson (Morrinsville) Maddox Fun House 1, Olivia Apatu (Hawke’s Bay) Alasaan Arzu 2, Sarah West (Matamata) Miss Mae West 3, Peita Milne (Nelson) BG Lennox 4, Ally Carson (Putaruru) Tiger Tale LS 5, Karis Spurway (New Plymouth) Kabo Cappesh 6, Rylee Sheehan (Te Aroha) Tony The Pony 7, Breanna Young (Hamilton) Delvay Pegasus 8. Silver Tour 1.35m Final: Katie Laurie (Australia) On the Point Sandy 1, Kimberley Bird (Ashburton) Cera Cassina 2, Logan Massie (Dannevirke) Lamondo GNZ 3, Karen Riddle (Rotorua) LC Telepathy 4, Alexa Randall (Auckland) LC Tango 5, Helen McNaught (Taupo) La Riviere 6. Bronze Tour 1.25m Final: Laura Inkster (Clevedon) Oporaes Jackamoe 1, Katie Laurie (Australia) Esteban MVNZ 2, Clarke Johnstone (Matangi) Watermill Glenneagle 3, Kimberley Bird (Ashburton) Euro Champagne 4, Tess Clark (Gisborne) Cadbury 5, Sarah West (Matamata) ERL Grey II 6. Junior/Amateur Tour Final: Isabella Du Plessis (Karaka) Fernhill Zinzan 1, Joanne Bridgeman (Cambridge) Junior 2, Shyanne Eagle (Tauranga) Castano II 3, Olivia Apatu (Hawke’s Bay) Astek Napoleon 4, Catherine Fawcett-McNaughton (Pukekohe) Golden Girl MVNZ 5, Georgina Forsyth (Clevedon) Joia Hara 6. Anne Symes Memorial Horse 1.3m Derby: Tamara Silcock (Nelson) Steel Magnolia 1, Kate Herdson (Auckland) Eon 2, Glen Beal (Pukekohe) All Expenses of Renton 3, Oliver Croucher (Rotorua) Waitangi Wi Fi 4, Nick Brooks (Cambridge) For Fame 5, Karen Riddle (Rotorua) LC Telepathy 6, Andy Daines (Kumeu) Spring Panorama 7, William Willis (Karaka) Sabine MS 8. Seven-Year-Old 1.3m Breeders Final: Alex Loiselle (Ocean Beach) Bandito NZPH 1, Catherine Cameron (Cambridge) Kingslea Couture 2, Elle Phillips (Matangi) Cirrius GNZ 3, Tegan Fitzsimon (West Melton) Windermere Cappuccino 4, Anna Trent (Wellington) Corodette Xtreme 5, Sally Steiner (Tauranga) Bewitched NZPH 6. Six-Year-Old 1.2m Breeders Final: Rachel Malcolm (Cambridge) Monte Carlo MVNZ 1, William Willis (Karaka) Cassera MS 2, Sally Steiner (Tauranga) Cartoon NZPH 3, Michelle Wakeling (Wellsford) BMW Numero Uno 5, Catherine Cameron (Cambridge) Kiwi Fern 6. Five-Year-Old 1.1m Breeders Final: Georgia Massie (Dannevirke) Double J Kelvin 1, Katie Laurie (Australia) Gale 2, Sam McIntosh (France) Malarkey 3, Alex Loiselle (Ocean Beach) Dakota NZPH 4, Phillip Steiner (Tauranga) Cassina Dior 5, Jesse Linton (Hastings) Expozay KCE 6. Four-Year-Old 1m Breeders Final: Sam Matthews (Cambridge) Fleur DeLacour 1, Katie Laurie (Australia) Isla and Jackie Jermyn (Matangi) Chalo ECPH =2, Logan Massie (Dannevirke) Avenger Xtreme 4, Helen McNaught (Taupo) Corona Xtreme and Brayden Aarts (Pukekawa) Camberley Phoenix AF =5.